In our Issue 6: Sep-Oct 2011 edition we included a CD insert of the MyHeritage Family Tree Builder software and now that terrific family history tool has been updated for the big changes underway at MyHeritage! MyHeritage releases Family Tree Builder 7.0 to bring the power of the cloud to genealogy software. Updated version of world’s most popular free family history software now syncs with online and mobile, opens new channels for the discovery of historical records and is also now available in Chinese, Japanese and Korean. 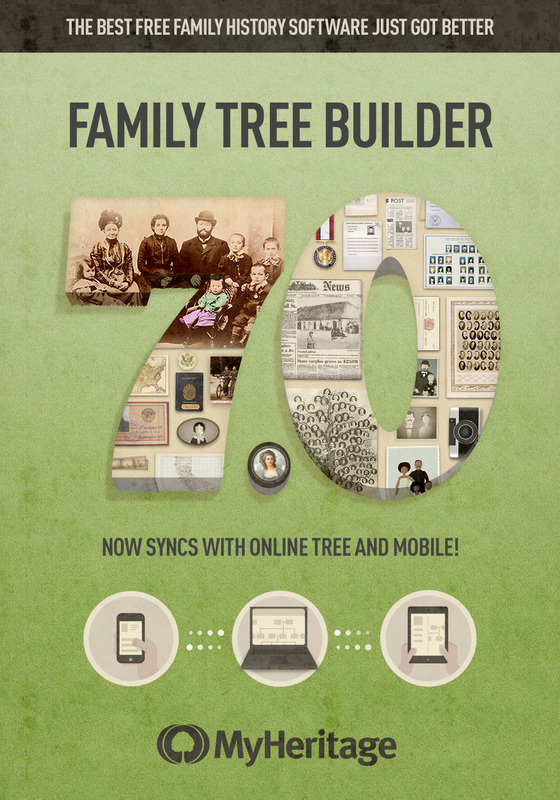 MyHeritage, the popular family history network, today announced the release of Family Tree Builder 7.0, free genealogy software that combines innovative technology with easy-to-use features. The millions of family history enthusiasts and genealogists worldwide using Family Tree Builder to explore, document and showcase their roots, can now synchronize their family tree between different devices and enjoy sophisticated ways of making new discoveries via the cloud. Family Tree Builder 7.0 is available as a free download. Using the new software, users can now optionally synchronize their entire family history between their computer and their online family tree on MyHeritage. This connection of genealogy software to the cloud enables users to access their family history anytime and anywhere. It also enables users to benefit from the renowned network effects of MyHeritage’s huge user community, with advanced matching technologies that automatically search millions of user-contributed family trees from around the world and a database of billions of historical records, to help users make breakthrough discoveries. The new version 7.0 adds new languages to cater to family history fans in the Far East, enjoys a graphical facelift and sports better looks. All family tree information is synchronized, including photos, videos, audio files, notes, sources, citations and other information, except private information such as DNA markers which never leaves the user’s computer. The family history data can now be privately and securely viewed, edited and expanded from any device – the user’s computer, the user’s online family site on MyHeritage – or via the free MyHeritage mobile apps for iPad, iPhone and Android. Users have full control of who can be granted permission to view or add information. The new sync system also provides a backup of the users’ precious data. Whereas previous versions of Family Tree Builder already enjoyed Smart Matching™ technology, which brought users matches from the millions of user-contributed family trees on MyHeritage, the new version 7.0 is the first to enjoy the company’s successful Record Matching technology, recently praised by well-known genealogy bloggers and opinion leaders James Tanner and Randy Seaver as “magic”. Record Matching is a discovery-finder and a time-saver. It automatically researches every individual in the user’s family tree and looks for matching historical records with high accuracy. All historical records found are consolidated in one convenient report, which the user can then go over systematically. Record Matching is the world’s first and only technology capable of automatically finding newspaper articles about one’s ancestors. Family Tree Builder 7.0 has been rewritten to support Unicode, which means that data can be entered in any language and saved accurately as entered. The software has been expanded from 37 to 40 languages, by adding support for the first time for Chinese (Simplified and Traditional), Japanese and Korean, as MyHeritage expands its global network into the Far East. The full range of features in Family Tree Builder is ideal for beginners and professionals alike, and includes photo albums, automatic face detection technology for photo tagging, beautiful family tree charts, poster printing, reports and statistics, interactive maps, support for DNA, automatic consistency checks and much more. The software is based on the Freemium model. It can be downloaded and used for free for building an unlimited-sized tree on one’s computer. Premium features of the software can be unlocked for a one-time purchase and affordable subscriptions are available for online family sites of unlimited capacity and access to premium content. Family Tree Builder 7.0 is available as a free download is available for Windows. The company is working on adding support also for Mac OS X and this will be available starting with the next version of the software.